ComEd has programs to build the skills of its current workforce and train its future workforce. ComEd’s Fidel Marquez works with a teen at ComEd’s Solar Spotlight program. 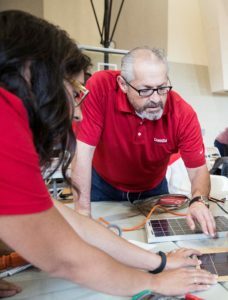 As the energy industry continues to evolve, there are going to be a lot of jobs created involving skills that don’t exist today, says Fidel Marquez, senior vice president, Governmental and External Affairs, ComEd. But ComEd has programs in place to build the skills of its current workforce and train its future workforce, he says in an interview in POWERGRID International magazine. Fidel highlights ComEd’s CONSTRUCT program, a nine-week job training program to prepare students for entry-level jobs in construction and energy-related fields. This year’s program includes training in solar energy in response to the June implementation of the Future Energy Jobs Act, which sets Illinois on the path to become a national leader in clean energy and energy efficiency and is poised to create thousands of clean jobs. In addition, ComEd builds its future workforce by teaching children about science, technology engineering and math (STEM) through programs such as Solar Spotlight and the Icebox Derby. Read the full story in POWERGRID Magazine.